user warning: Table './active5_foxes/cache_filter' is marked as crashed and should be repaired query: SELECT data, created, headers, expire, serialized FROM cache_filter WHERE cid = '2:817fa79ba092c867991f21f5c65c2cb9' in /home/active5/public_html/drupal6_multisite/includes/cache.inc on line 25.
user warning: Table './active5_foxes/cache_filter' is marked as crashed and should be repaired query: UPDATE cache_filter SET data = '<p class=\"rtecenter\"><img alt=\"\" src=\"http://www.catchingfoxes.com/sites/www.catchingfoxes.com/files/resize/blog/IMG_2635_0-400x300.jpg\" style=\"border-top-width: 5px; border-right-width: 5px; border-bottom-width: 5px; border-left-width: 5px; border-top-style: solid; border-right-style: solid; border-bottom-style: solid; border-left-style: solid; margin-left: 10px; margin-right: 10px; margin-top: 10px; margin-bottom: 10px; width: 400px; height: 300px; \" title=\"\" width=\"400\" height=\"300\" /></p>\n<p>I haven&#39;t had much time to blog lately, because I&#39;ve been sitting in that chair way past midnight most nights surrounded by books and coffee. &nbsp;Just today,&nbsp;I checked another stack of books out of the college library. &nbsp;The sophomore behind the counter stamped the return date on the inside cover. &quot;These are due back in three weeks - May 7th,&quot; she said. &nbsp;I literally gulped. &nbsp;That&#39;s finals week. &nbsp;Just three weeks away? &nbsp;Oh gosh!</p>\n<p>This is the final semester of my undergraduate degree. &nbsp;</p>\n<p>But it&#39;s also just my third semester since I decided to go back to school. &nbsp;</p>\n<p>I&#39;ve been sitting on 100 college credits since I stopped going to class mid-semester, 1989. <span style=\"font-size:14px;\"><strong>In hind sight, I can&#39;t say that leaving college was an error.</strong></span> I wasn&#39;t focused. &nbsp;I had switched majors too many times to count. I was distracted by life - my recent marriage, stepsons, and soon a new baby.&nbsp;&nbsp;I didn&#39;t even bother to withdrawal from my courses that winter term. &nbsp;That decision - not to follow through with the paperwork to formally withdrawal - wasn&#39;t a wise move. &nbsp;Someday soon I&#39;ll write about what it took to get back into college having five F&#39;s on my transcript! &nbsp;But on with this story....</p>\n<p>It&#39;s been a literal whirlwind returning to college - 30 credits in less than a year. Our family has had to create new patterns for living. Just as I&#39;m starting to feel comfortable in this new student role, it&#39;s ending. (Comfortable = I know the names of the buildings and where to find the women&#39;s bathrooms in most of them! )</p>\n<p>At Christmas time, a friend&#39;s husband asked what I was going to school for - what job was I headed towards? Good question! &nbsp;</p>\n<p>My degree is a Bachelor&#39;s in Interdisciplinary Studies - a focus I created merging three interest areas of History, Education, and English. &nbsp;I had to develop a course of study, seek approval by a committee, and argue my future goals couldn&#39;t be served by the institution&#39;s existing degrees. &nbsp;I spent months last winter writing essays and submitting paperwork for such approval. &nbsp;</p>\n<p>My proposed goal - homeschooling my own children and teaching co-op classes for other homeschoolers - was not much different than the jobs I held before college. &nbsp;I still marvel that they approved my proposed course of study.</p>\n<p><span style=\"font-size:14px;\"><strong>So I went back to college to earn a degree to be me!</strong></span></p>\n<p>But there&#39;s more.....</p>\n<p>For twenty-three years I&#39;ve invested a lot of time into other&#39;s lives. &nbsp;Specifically seven little lives and one man size one. And those little people are growing up and moving off to amazingly wonderful futures. Over recent years, I&#39;ve had countless people tell me what great kids I have. &nbsp;</p>\n<p>That is true, Rich and I have seven great kids. &nbsp;</p>\n<p>If my life&#39;s work ended with the raising of my family, I would finish with a deep satisfaction of each day well spent.</p>\n<p>However, while raising my children has been very rewarding, over the years I had quietly come to believe it was the full extent of what I could do. &nbsp;My identity was so tangled up in what I did to serve my family that I had practically forgotten who I was as an individual. &nbsp;</p>\n<p>Then one Sunday morning, &nbsp;a woman at church pulled me aside. &nbsp;It was October, 2010. We had only just started attending this new church months earlier. I didn&#39;t know she knew my name. I remember her words as if she just said them to me today.</p>\n<p>&quot;Kim, you are such a skilled individual. I see that in everything you do. &nbsp;Your writing has touched me deeply. &nbsp;How are you growing the gifts the Lord has given you?&quot;&nbsp;</p>\n<p><span style=\"font-size:14px;\"><strong>Me? Gifted? Skilled?</strong></span> &nbsp;I hadn&#39;t heard that before. I heard repeatedly that the result of my efforts were effective - those great kids. &nbsp;But I had not heard that Kim, as an individual separate from her role as a wife and mother, had anything to offer the world.</p>\n<p>Heard is a pivotal verb in that last sentence. &nbsp;I suspect someone might have mentioned something of the sort at some point. But not loud enough. Because I didn&#39;t hear it until that October morning. &nbsp;</p>\n<p><span style=\"font-size:14px;\"><strong>I went back to college as an experiment - to see what God might do if I explored some of my interests outside of homemaking and homeschooling.</strong></span> &nbsp;I had no goal of leaving that first career, which I still love passionately. (Ok, maybe I do get tired of cooking for all these men now and again...) &nbsp;I simply wanted to see what skills and gifts He might have given me that I haven&#39;t developed.</p>\n<p>In the last three semesters, I&#39;ve learned that the Lord has given me a love of learning that is not common to everyone. &nbsp;I&#39;ve realized I have an intense interest in the processes and theories of writing, and an enjoyment in researching, studying, and synthesizing new ideas. 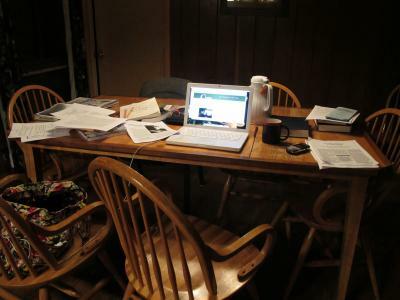 (Remember the photo of all the books on the table way back at the beginning? &nbsp;Ya, doing that stuff! )&nbsp;</p>\n<p>So just as timidly as I applied to undergraduate admission last winter, I&#39;ve spent this winter applying to graduate schools. &nbsp;With apprehension, I stepped onto the college campus last summer after twenty plus years as a stay at home mom; with nervousness, I enrolled in graduate classes today. &nbsp;Next fall, I&#39;ll be back in the classroom - working on my master&#39;s.&nbsp;<strong><span style=\"font-size:14px;\">Just an experiment to see what God might do with my skills and talents.</span></strong></p>\n', created = 1555819941, expire = 1555906341, headers = '', serialized = 0 WHERE cid = '2:817fa79ba092c867991f21f5c65c2cb9' in /home/active5/public_html/drupal6_multisite/includes/cache.inc on line 108.
user warning: Table './active5_foxes/cache_filter' is marked as crashed and should be repaired query: UPDATE cache_filter SET data = '<p class=\"rtecenter\" style=\"\"><a href=\"http://www.facebook.com/CatchingFoxes\" target=\"_blank\"><img alt=\"\" src=\"/sites/www.catchingfoxes.com/files/resize/social/facebook-64x64.png\" style=\"text-align: center; width: 64px; height: 64px; \" width=\"64\" height=\"64\" /></a><a href=\"http://pinterest.com/kimmrankin/\" target=\"_blank\"><img alt=\"\" src=\"/sites/www.catchingfoxes.com/files/resize/social/big-p-button-64x64.png\" style=\"width: 64px; height: 64px; \" width=\"64\" height=\"64\" /></a><a href=\"mailto:kim@catchingfoxes.com\" target=\"_blank\"><img alt=\"\" src=\"/sites/www.catchingfoxes.com/files/resize/social/mail-64x64.png\" style=\"width: 64px; height: 64px; \" width=\"64\" height=\"64\" /></a><a href=\"http://www.catchingfoxes.com/rss.xml\" target=\"_blank\"><img alt=\"\" src=\"/sites/www.catchingfoxes.com/files/resize/social/rss-64x64.png\" style=\"width: 64px; height: 64px; \" width=\"64\" height=\"64\" /></a></p>\n', created = 1555819941, expire = 1555906341, headers = '', serialized = 0 WHERE cid = '2:48be9f28bc948ea32b70445d0a590c98' in /home/active5/public_html/drupal6_multisite/includes/cache.inc on line 108.
user warning: Table './active5_foxes/cache_filter' is marked as crashed and should be repaired query: UPDATE cache_filter SET data = '<div class=\"fb-like\" data-font=\"verdana\" data-href=\"http://www.facebook.com/CatchingFoxes\" data-send=\"false\" data-show-faces=\"true\" data-width=\"280\">\n	&nbsp;</div>\n', created = 1555819941, expire = 1555906341, headers = '', serialized = 0 WHERE cid = '2:854065b9b61ff8596c8fa62e384317c7' in /home/active5/public_html/drupal6_multisite/includes/cache.inc on line 108.
user warning: Table './active5_foxes/cache_filter' is marked as crashed and should be repaired query: UPDATE cache_filter SET data = '<p><strong>Catch for us the foxes, the little foxes that ruin the vineyards, our vineyards that are in bloom. </strong><br /><em>Song of Solomon 2:15 NIV</em></p>\n<p>Metaphorically, the &quot;foxes&quot; are the damaging attitudes and actions that can creep in and threaten the love relationship of a couple and a home. &nbsp;Catching Foxes is committed to being a resource as you guard against the things that might injure and destroy the harvest you are striving to grow in your home.</p>\n', created = 1555819941, expire = 1555906341, headers = '', serialized = 0 WHERE cid = '2:132a8457abcc78748ef29251eaa8f1d7' in /home/active5/public_html/drupal6_multisite/includes/cache.inc on line 108.
user warning: Table './active5_foxes/cache_filter' is marked as crashed and should be repaired query: UPDATE cache_filter SET data = '<p><a href=\"mailto:kim@catchingfoxes.com\">kim@catchingfoxes.com</a></p>\n', created = 1555819941, expire = 1555906341, headers = '', serialized = 0 WHERE cid = '2:fe7b2055d10a2c25c439ca4710d86502' in /home/active5/public_html/drupal6_multisite/includes/cache.inc on line 108. I haven't had much time to blog lately, because I've been sitting in that chair way past midnight most nights surrounded by books and coffee. Just today, I checked another stack of books out of the college library. The sophomore behind the counter stamped the return date on the inside cover. "These are due back in three weeks - May 7th," she said. I literally gulped. That's finals week. Just three weeks away? Oh gosh! This is the final semester of my undergraduate degree. But it's also just my third semester since I decided to go back to school. At Christmas time, a friend's husband asked what I was going to school for - what job was I headed towards? Good question! My degree is a Bachelor's in Interdisciplinary Studies - a focus I created merging three interest areas of History, Education, and English. I had to develop a course of study, seek approval by a committee, and argue my future goals couldn't be served by the institution's existing degrees. I spent months last winter writing essays and submitting paperwork for such approval. My proposed goal - homeschooling my own children and teaching co-op classes for other homeschoolers - was not much different than the jobs I held before college. I still marvel that they approved my proposed course of study. So I went back to college to earn a degree to be me! For twenty-three years I've invested a lot of time into other's lives. Specifically seven little lives and one man size one. And those little people are growing up and moving off to amazingly wonderful futures. Over recent years, I've had countless people tell me what great kids I have. That is true, Rich and I have seven great kids. If my life's work ended with the raising of my family, I would finish with a deep satisfaction of each day well spent. However, while raising my children has been very rewarding, over the years I had quietly come to believe it was the full extent of what I could do. My identity was so tangled up in what I did to serve my family that I had practically forgotten who I was as an individual. Then one Sunday morning, a woman at church pulled me aside. It was October, 2010. We had only just started attending this new church months earlier. I didn't know she knew my name. I remember her words as if she just said them to me today. "Kim, you are such a skilled individual. I see that in everything you do. Your writing has touched me deeply. How are you growing the gifts the Lord has given you?" Me? Gifted? Skilled? I hadn't heard that before. I heard repeatedly that the result of my efforts were effective - those great kids. But I had not heard that Kim, as an individual separate from her role as a wife and mother, had anything to offer the world. Heard is a pivotal verb in that last sentence. I suspect someone might have mentioned something of the sort at some point. But not loud enough. Because I didn't hear it until that October morning. I went back to college as an experiment - to see what God might do if I explored some of my interests outside of homemaking and homeschooling. I had no goal of leaving that first career, which I still love passionately. (Ok, maybe I do get tired of cooking for all these men now and again...) I simply wanted to see what skills and gifts He might have given me that I haven't developed. So just as timidly as I applied to undergraduate admission last winter, I've spent this winter applying to graduate schools. With apprehension, I stepped onto the college campus last summer after twenty plus years as a stay at home mom; with nervousness, I enrolled in graduate classes today. Next fall, I'll be back in the classroom - working on my master's. Just an experiment to see what God might do with my skills and talents.